2011 is proving to be a good year for those people living in France as far as taxes are concerned, with significant changes already made or planned. The latest changes are concerning UK expatriates who have been affected by the UK's 90 day residence rule. With effect from 6th April 2012, most expats will now be able to spend up to 119 days in the UK, and still remaon a non resident in most cases. French Wealth Tax has also seen significant changes, with the threshold increased from 800,000 Euros to 1.3 million € (effective 2011), and coming soon, just 2 bands of tax 0.25% between 1.3 and 3 m €, and 0.5% for above 3 m €, (effective 2012). Succession & Gift Taxes have also changed. Coming to France offers many financial planning opportunities, especially via QROPS & QNUPS arrangements. The benefits include examption from all UK taxes on death if you have been non UK resident for 5 consecutive years, (a potential saving of 55%). These plans also avoid French succession law and offer other additional benefits. As usual, new tax laws bring with them new opportunities to plan your finances, (different and better). We are able to offer the best quality Independent Financial Advice via our dedicated contacts, (for whom we are registered introducers). One of my pet hates is French agencies using “sole agency” on their properties without explaining the potential outcome to their clients, (the vendors). In the Poitou Charentes, there is one well-known agency who is particularly active in this respect. There is also one Notaire who is also into the exclusive agency business. What does it offer for the vendor – well, not a lot apart from a number of promises by the agent, which they will struggle to keep. Normally this is based on increased advertising and internet presence. In practice, it means that the agency can sit back a bit in the knowledge that they have blocked the sale of the property by any other agencies for a period of at least ¼ of the year, sometimes even longer. The agent that I have in mind, currently has 34 properties advertised as sole agent, even though I have seen a registered mandat with another agency, created before their exclusive mandat, that is still valid. So that could prove interesting ! This agency takes out a small 2 property advert in the French Property press, so over the period of a quarter only 6 out of those 34 properties will benefit from this “high profile” marketing. 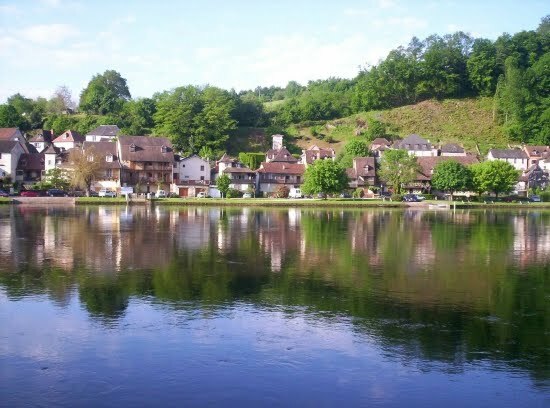 In the Dordogne valley, if we enter into an exclusive agreement, it is very much on a “gentleman’s agreement”, and the vendor only signs a non-exclusive mandat, there being trust between both parties that the deal will be honoured. In return we are able to arrange floor-plans and elevated photography to make the property really stand out in the market place. We think this added-value is much better than an empty promise. Rarely to vendors know how to get out of these exclusive mandates, which normally requires a registered letter (AR), towards the end of the 3 month exclusive period as a minimum, to renounce the contract. 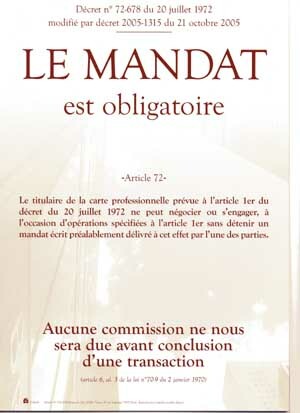 Mandates for the purchase of French property are often signed in haste by keen sellers and buyers and repented on at leisure. They are a fruitful source of work for litigation lawyers in France and regularly keep the French Appeal Courts and Supreme Court occupied. UK buyers and sellers are at a big disadvantage as the system in England is not the same and they do not understand what they are signing. So, you have been warned.